Gobekli Tepe in Turkey is one hell of a site, and that is about the only thing everyone can agree on. I talked about the context of the site in Part 1; now we’ll have a look at the site itself. There are lots of ideas about what was happening there, depending on whom you ask. It was the place where survivors of the Lost Civilization taught the arts of agriculture and architecture to primitive hunter-gatherers. It was an astronomical observatory, recording the catastrophic impact of comet fragments at the beginning of the Younger Dryas. It was a hoax perpetrated by the Turks. It was built by Australian aborigines. It was built to worship Sirius, or point to Deneb in the constellation Cygnus, or to link Earth with the alien megastructure at Tabby’s Star, also in Cygnus. It was one node of a resonant global oscillator. It was the wellspring of civilization. It was the site of the first temple, and the birthplace of religion. And so forth. To archaeologists, though, it is a shiny new toy, a site full of fascinating implications. 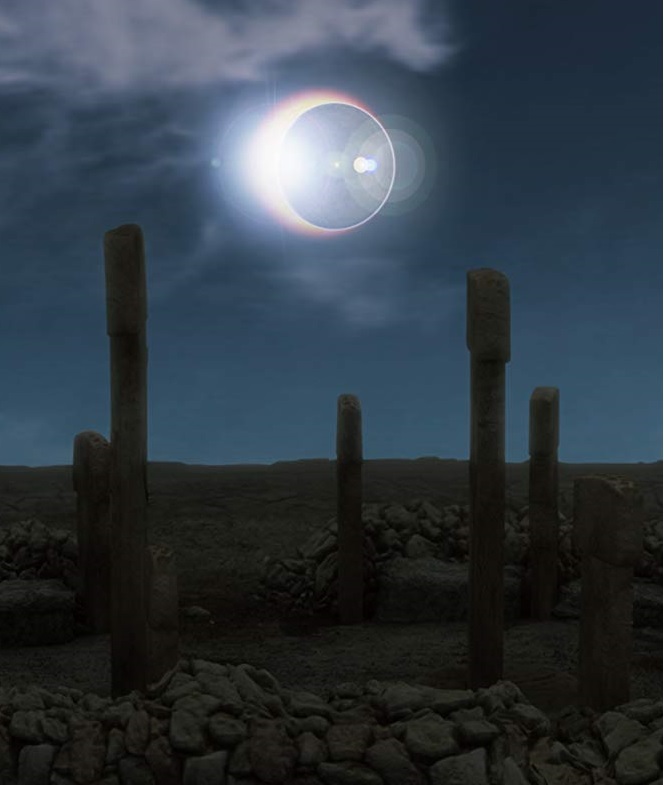 The composite popular conception of the site pushed by fringe scholars goes like this: at the end of the Younger Dryas, the last gasp of the most recent Ice Age, a bunch of hunter-gatherers took time from their struggle for survival to build a vast concourse of megalithic temples, astronomically aligned, open to the sky, filled with sophisticated artwork and arcane significance. Who taught and organized them to do this is an open question. And then, after about 1500 years of meeting at the site for ritual activities while never actually living there, these progenitors of civilization buried the temples under a huge artificial hill, and buggered off. The rest is history. This narrative is simple, dramatic, and appealing. It is wonky in so many ways that I hardly know where to start. So let’s start with the fact that only about 5% of the tell had been excavated, and no structure had been fully excavated, at the time those confident narratives were spun. To the alternos, this meant only that many more revelations awaited, and they were not wrong. But to archaeologists, it meant we could not yet have any clear idea of how the structures within each of the two main levels related to each other stratigraphically and chronologically, nor how different areas of this sprawling site were connected. In fact, working all this out became the priority of the excavations as from 2016. What is already clear is that the structures were certainly not all built in one great burst of creative endeavour by massive teams of labour. Nor does it seem they were all buried at the same time. The archaeological reality is far messier than that. To recap the layout of the site, the building history falls into three general phases. Don’t worry about Level I, consisting of later sediments and a ploughing horizon. 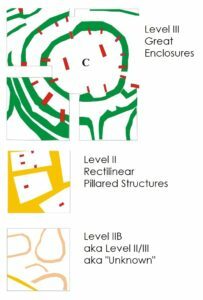 Level III is the oldest and the one that all the fuss is about, with the large roundish “temples” and tall T-shaped pillars, dated to the Pre-Pottery Neolithic A (PPNA). Five have now been fully or partially excavated (B, C, D, E, and H), and geophysical soundings indicate that more lurk under the ground. At this point, no similar structures are confirmed from other sites; the tall T-shaped pillars with their rich adornment are so far unique. Level II features smaller rectilinear structures, many of them with much shorter T-shaped pillars than those found in Level III, dated to the Pre-Pottery Neolithic B (PPNB). Similar buildings have been found at numerous sites in the area, as special structures surrounded by clearly domestic dwellings, though never in such profusion as at Gobekli Tepe. In fact, the shorter T-shaped pillars are a sort of leit-motif of the Southern Anatolian PPNB. One has been extensively excavated (G); as well, Structures A and F share features of both the Level II and Level III enclosure types, and may be transitional. Also at Gobekli Tepe are a number of small roundish structures with no pillars at all, originally thought to be dated either early in Level II (=Level IIB), or intermediate in age (=Level II/III); in later publications, however, they are simply dated “Unknown.” I’ll return to those later. Note: the transition from roundish (PPNA) to rectilinear (PPNB) structures is general across the Fertile Crescent. In this respect, Gobekli Tepe fits right in. These levels are not neatly layered, like tiramisu. Some Level III structures apparently continued to be exposed while Level II structures were built around or among them, respecting their boundaries, resulting in “hollows” where Level III directly underlies Level I. In other areas, Level II structures at least partly overlie and overlap Level III structures. The higher areas—the “knolls”—have not, as far as I know, been excavated below Level II, so we do not know what is under them. Further complicating the picture is evidence of extensive rebuilding, rejigging, and general messing around with the Level III enclosures, including shifting and recycling the monumental T-shaped pillars. At some point in antiquity, robber pits were even dug down into some enclosures, to allow the pillars to be extracted or destroyed. 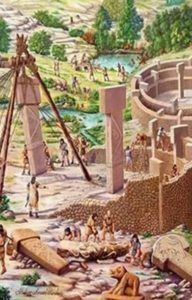 Contrary to the alternos’ narrative, the great “temples” of Gobekli Tepe are not in pristine off-the-drawing-board condition. Okay, we’re now in a position to examine some of the alternos’ claims. In fairness, some of these ideas took off from early interpretations made by Gobekli Tepe’s discoverer, the late Prof. Dr. Klaus Schmidt, but the excavations have moved on since then. 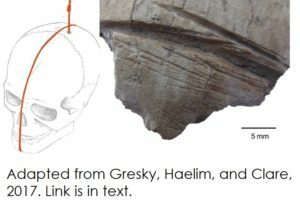 Claim: Nobody lived at Gobekli Tepe. Schmidt stoutly maintained for some years that Gobekli Tepe was a purely ritual site, that hunter-gatherers from all over the region came together to build the monumental structures, but never actually lived there—thus, the organization of that work force was both a mystery and a bit of a miracle. Schmidt based his assessment partly on the lack of evidence in the monumental enclosures for any kind of domestic occupation (hearths, middens, etc), and partly on the presumed lack of adequate water resources to support a permanent population. However, evidence is growing that Gobekli Tepe was indeed occupied by a permanent population, even during the era when the great enclosures were being built. In particular, two areas of the site have now yielded significant amounts of carbonized botanical material: one is the area beside Enclosures C and D, where the little-regarded ovoid structures previously designated as Level II/III lie; the other is from a sounding on the edge of the northwest depression, near a newly excavated ovoid structure of markedly domestic appearance. The C14 dates from these will be of great interest, as will be further soundings under the Level II structures on the “knolls.” At any rate, these structures are consistent with PPNA dwellings found elsewhere. Rain-storage features have also started to show up, in the form of cisterns on the plateau, and what appears to be water or drainage channels excavated into the bedrock in the northwest depression, covered with stone slabs. The huge array of flint debitage indicates an extensive local stone-tool industry. At any rate, an alternate picture of Gobekli Tepe can be proposed: a major PPNA settlement along the lines of Tell Qaramel, Wadi Faynan Site 16, and Jericho, fed from wild plant and animal resources in the burgeoning post-Dryas landscape, and following much the same trajectory as the rest of the Fertile Crescent. 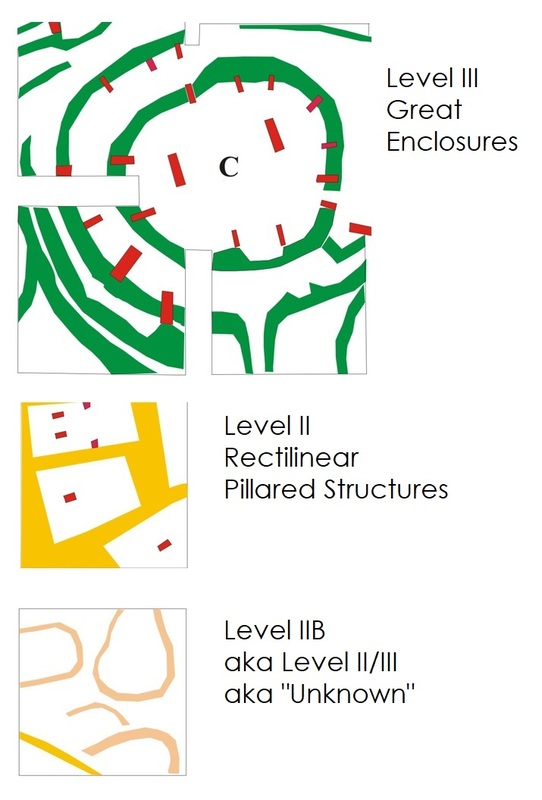 Claim: the Level III structures were temples. Again, Schmidt was insistent upon this; the two tall anthropomorphic T-pillars in the centre of each great structure represented supernatural beings, gods. 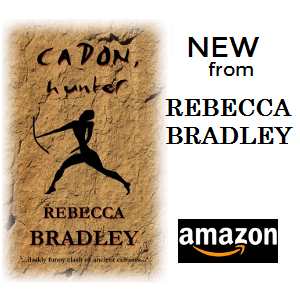 These were therefore the first stone-built temples in the world, where hunter-gatherers from a large catchment area would gather seasonally for rituals and ritual feasting. This was the birth of religion, and it predated both permanent settlement and agriculture. The implication? That, contrary to the consensus, religion was the driving force that kicked off the drive towards complex civilization; that the temple came first, and was later followed by sedentation and the population spiral. The media loved it, as did the alternos. Except it rather misrepresented both the archaeological consensus and the archaeological situation. Markers of religious/supernatural/magical ideation are visible throughout the Paleolithic. As I’ve already pointed out, pre-agricultural settlements had been around since the Epipaleolithic, and major settlements contemporary with Gobekli Tepe, which also include large nondomestic structures, are known from the Levant. First, they were almost certainly roofed, with the beams supported by the great central T-pillars. This lays doubt on claims they were astronomical observatories. The footings for the standing T-pillars are surprisingly shallow, suggesting that the roof actually stabilized them in their upright position. Note that they are now necessarily stabilized with cables, or they would fall over. Second, the fabulous decoration on the pillars is a whole menagerie of animal species, but their distribution is not random. 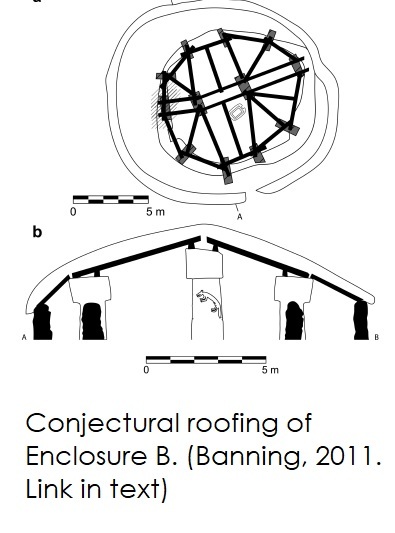 In each of the four enclosures most fully excavated, one class predominates: snakes in Enclosure A, foxes in B, boars in C, and birds in D. A plausible explanation is that these were totemic animals for different clans, social groupings, hunting societies, or even secret societies, each with its own exclusive communal clubhouse. Combinations of animals with other pictorial elements open up the possibility of commemorative narratives—say, of memorable hunts, raids, or feasts. The few human figures are mainly headless, which ties into a longstanding funerary tradition across the Fertile Crescent. Indeed, Indeed, some of the skull fragments recovered from the fill are neatly pierced and grooved as if to facilitate hanging decoratively from the rafters—more Temple of Doom than Temple of Light. Claim: GT was an enormous spread of megalithic structures, representing the efforts of an enormous labour force. First off, we have little idea yet about which Level III structures were built when, nor how many were built or in use at any given time. One structure built every ten years would obviously require a smaller labour force than, say, ten structures built in one year. We need to know more about the overall chronology of the site. There are some megaliths, all right, but the vast majority of the building material used is small, rough limestone chunks built up into dry masonry walls. The megaliths involved are mainly the T-shaped pillars, which are indeed awe-inspiring—but their awesomeness has been exaggerated by the alternos. Various wild figures for their weights are flying about the internet, starting at 20 tons and going as high as 60. The archaeologists, however, estimate the largest pillar excavated to be 5.5m tall and about 10 metric tons in weight. The tallest and heaviest megaliths are the two found in the centre of each great enclosure, but most of the others are about half that size, or less. There is a much larger one roughed out in the quarry, estimated at 40 metric tons, but it was never moved. How the pillars were quarried is relevant. They are essentially big stone paper dolls. The limestone quarry is sliced by natural cleavage planes into convenient layers 0.6-1.5m thick; the masons chipped out a T-shaped trough and pried out the resulting pillar along the cleavage plane, which accounts for the pillars’ slender profiles. The effort of moving them the short distance from the quarry has also been overblown; the only serious calculations I’ve seen are by Edward Banning—even overestimating the weight of the pillars, his labour estimates (below) are surprisingly modest. 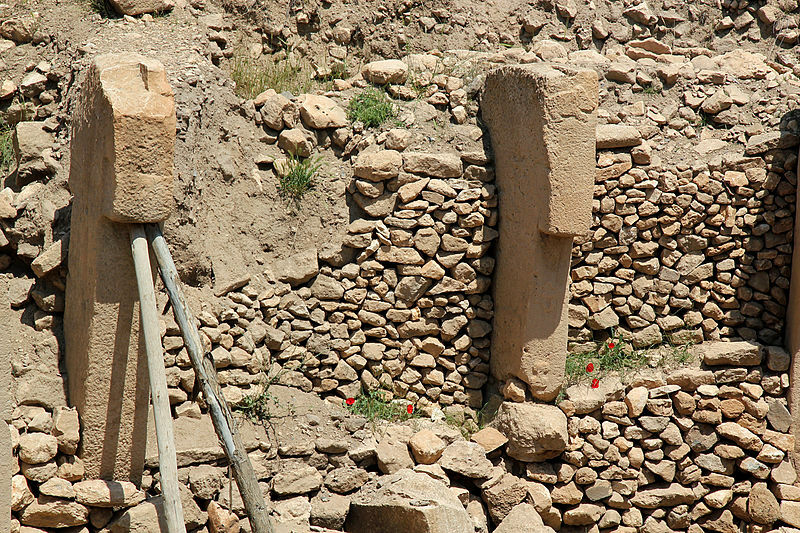 The megaliths of Gobekli Tepe were stunningly innovative, and an amazing achievement, but not outside the technical capabilities of a Neolithic settlement. Claim: GT was buried wholesale under a great artificial hill in about 8000 BC, and then abandoned. 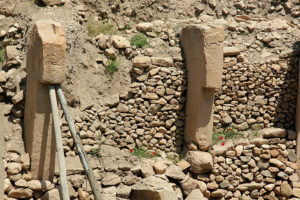 Deliberate burial of decommissioned structures would not be unique to Gobekli Tepe—it is attested all over the Neolithic Near East, often followed by construction of a new building over the ruins of the old. 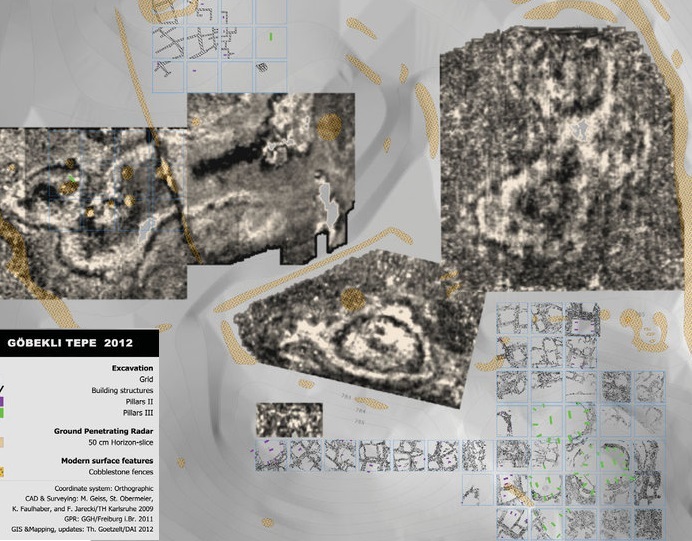 It does appear that at least some of Gobekli Tepe’s enclosures were indeed deliberately backfilled, but not all at the same time, and not at the time the site was abandoned. 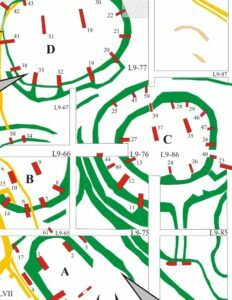 For example, preliminary efforts to interpret the building history of Enclosures A-D suggest that C was under construction even as D was being backfilled, and that A is considerably younger than either. If further Level III enclosures underlie the Level II buildings on the knolls, then they were certainly backfilled long before Gobekli Tepe fell out of use. Again, the mantra: the stratigraphy needs a lot more work. An intentional (ritually charged) burial of buildings was previously posited; more recently, however, other explanations appear increasingly likely, including inundation from building collapse and eroded deposits from higher-lying and adjacent parts of the mound. These latter processes (collapse and erosion) would also account for the highly fragmented nature of human (and animal) bone contained in the backfill, thus providing first indications of a potential (formerly unknown) provenance for this material. Overall, as the work at Gobekli Tepe continues and data accumulate, element after element of the original interpretation is being called into question—by the archaeologists. The alternos, not so much. In the final part of this series, I’ll be looking in more detail at some “alternate” explanations of Gobleki Tepe, as well as what makes the place so damned exciting for archaeologists. For a good description of the current state of the site and research, see the UNESCO nomination description. For updates on activities at the site, plus a wealth of papers and other information put out by the excavators of Gobekli Tepe, see their weblog, The Tepe Telegrams. I’d like to know your source for saying the enclosures were ‘almost certainly roofed’. We read through the book cited by Notroff et.al. in their rebuttal of our ‘Fox’ paper, and there was nothing in there that indicated this. Yes, they might have been roofed, at some point in their use – this cannot be ruled out, but to say they were almost certainly roofed from the beginning of their construction is, to my knowledge, misleading. So, please provide a reference. No problem with the rest of your piece, except it is now beyond any doubt the animal figures represent constellations. This is effectively proven with the publication of my latest paper – see http://www.athensjournals.gr/ajhis/forthcoming. The patterns at Gobekli Tepe are completely consistent with observation of the Taurid meteor stream, and Pillar 43 almost certainly memorialises the Younger Dryas event. There is no real doubt about this. This is not ‘alterno’ speculation. It is hard science. Yes, that paper is well known. No evidence of roofs in there either. Highly speculative work. I’m wanting solid evidence. Sigh. Martin, I’m getting around to you eventually. In the meantime, do you have any suggestion about how those highly unstable pillars were kept from falling over? Just interested. Oh yes, I should have asked – is this the limit of your evidence? Surely not. Please provide a source for your claim that the enclosures were ‘almost certainly’ roofed. This is a very strong claim that requires very strong evidence to support it. I could speculate. But it needn’t involve roofs. Indeed, who would want to live a house so unstable? You should know that our ‘cave art’ paper is now published in the Athens Journal of History – there is much more exposition in this published work than the Arxiv version. I asked because you seemed quite willing to speculate that the pillars were freestanding at one point, and I wondered how you proposed they were supported. As for Banning’s paper, I find his reconstruction quite plausible, though I am unconvinced by his argument that the enclosures were domestic in nature. 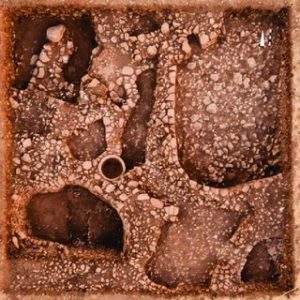 As for evidence, I’ve been following closely the publications put out by the Gobekli Tepe excavators, who are increasingly leaning towards classic roofed semi-subterranean circles – without, for example, the drainage features that would be necessary in an unroofed semi-subterranean structure. Another question for you: how, exactly, would you see the enclosures functioning as observatories, even if you could keep the pillars from falling over? Rebecca, you are quite right, it is speculation they were observatories, and I never claimed it wasn’t. I am careful about that. I have no hard evidence that the enclosures were used as observatories just as you have no hard evidence they were roofed. The difference between us is that while I admit this speculation you made a very strongly worded statement that they were ‘almost certainly’ roofed. You need to provide very strong evidence to support this. However, this is really beside the point. The only issue that really concerns me is interpretation of the symbols. After all, this will tell us the motivation for building the site and provide clues as to its function. As I said earlier, it is now beyond any reasonable doubt that my interpretation of the animal symbols is correct. In my papers I provide exceptionally strong scientific evidence to back this up. Based on this interpretation, their function as observatories is entirely reasonable, although, I agree, open to debate. As to how they might have functioned as observatories, I can’t see a major problem. To be clear, I said the pillars might have been ‘relatively free standing’. There are many ways the pillars can be stabilised, whilst remaining ‘relatively free standing’ that don’t entail roofs. I don’t think I need to be precise about this. Notice the ‘among other things’ qualification. 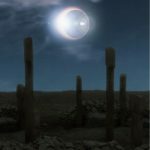 My personal view, based on current evidence, is that Gobekli Tepe was most likely a kind of Monastery or University, that combined religious education with ritual and astronomy. There might well have been some people living there, perhaps all year, but I doubt there was an entire village camped on top of the hill. If people did live there, where they lived exactly is an open question. To my mind, the large circular enclosures appear to have a religious/educational/astronomical aspect, rather than habitation. I see there’s a T-pillar with snake at Karahan Tepe and one with arms and hands from Nevali Çori. Are there other sites with T-pillars that have carvings on them?